Despite being relatively new here in the US. Ingrem is actually quite well known among the citizens of Shanghai, China. One of the largest malls in Shanghai, started installing a few of our machines throughout their shopping space. 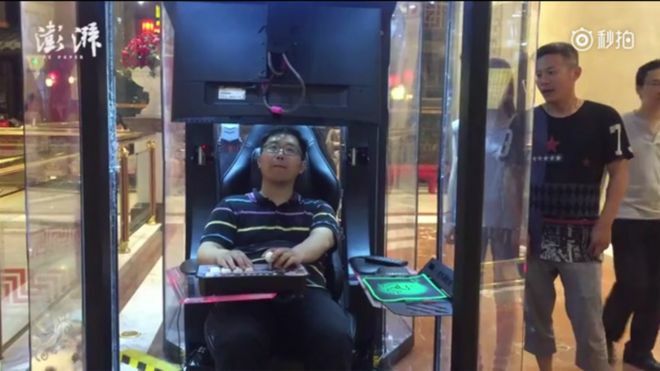 The chairs, including monitors, are placed inside glass pods for male shoppers to entertain themselves with games while their other halves are shopping away. The pod includes old school games for simple players and others can watch them play through the glass. As a trial run, the pods are free of charge for users, but as The Paper has reported, the mall will begin to charge a small fee in the future. A video displaying the husband pod and Ingrem workstation was posted on CNN News website. Check it out! There are numerous articles that were written about our workstations since they were installed in this mall. Different authors used different titles such as “husband pods”, “husband storage”, “man pod”, “glass pod”, etc. Business Insider tweeted about Ingrem’s husband pods! We love seeing customers and companies respond to our products! If you have any personal feedback yourself, let us know using our contact info!